"The air above Jerusalem is permeated with dreams and prayers," wrote the Jewish poet Yehuda Amichai - and then last Wednesday, Donald Trump caused a thunderstorm with one stroke of a pen. To the consternation of the whole world, he officially declared Jerusalem to be the capital of Israel. But Trump called his decision an important step in the peace process. Alternative peace, maybe. It was already known that Israel considers Jerusalem as its 'eternal and indivisible' capital. That the early Zionists gave Jerusalem less weight is less well known, as NRC editor Derk Walters wrote earlier this week. This is also evidently expressed in the Zionist propaganda posters from before 1948, the foundation year of the state of Israel. Images of empty landscapes under the sun were preferred. Inhabiting and cultivating a seemingly empty land looked, after all, more attractive than a country where others live already. In 1995 the Israeli artist and activist David Tartakover came out with a reprint of another 'forgotten' Zionist poster from 1936, about Jerusalem with the Islamic Dome of the Rock, the landmark of the city. The caption: Visit Palestine. 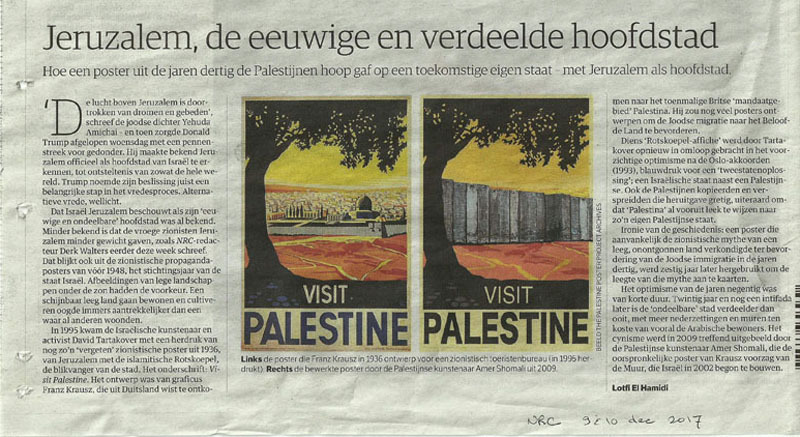 The design was made by graphic artist Franz Krausz, who escaped from Germany to the then British 'mandate' of Palestine. He would design many posters to promote Jewish migration to the Promised Land. His 'Dome of the Rock Poster' was reintroduced by Tartakover in cautious optimism after the Oslo Accords (1993), a blueprint for a 'two-state solution'; an Israeli state next to a Palestinian state. The Palestinians also copied and distributed this reissue eagerly, obviously because 'Palestine' already seemed to be pointing to such a Palestinian state. Ironic history: a poster that initially proclaimed the Zionist myth of an empty, unexplored country to promote Jewish immigration in the 1930s was reused sixty years later to address the emptiness of that myth. The optimism of the nineties was short-lived. Twenty years and another intifada later, the 'indivisible' city is more divided than ever, with more settlements and walls at the expense of mainly the Arab inhabitants. Cynicism was aptly portrayed in 2009 by the Palestinian artist Amer Shomali. He added a picture of the the Wall on the original poster by Krausz. Israel began to build the Wall in 2002.